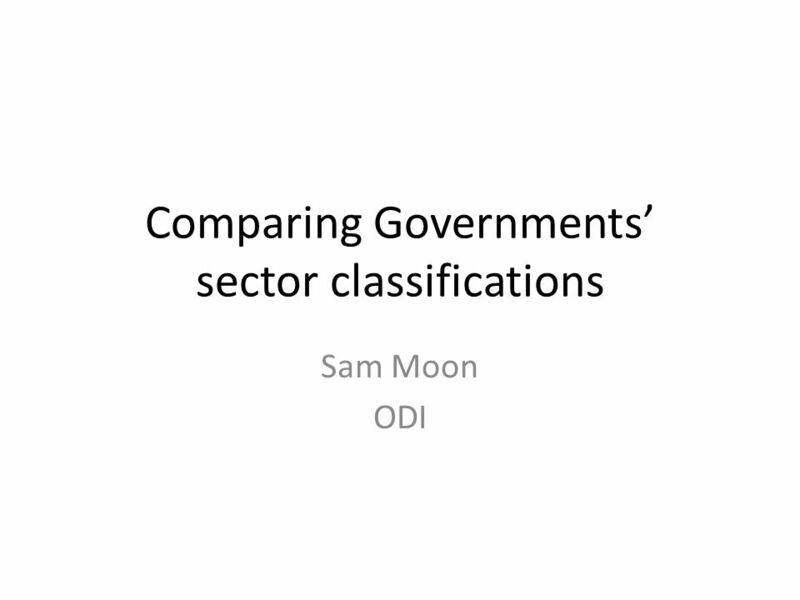 Comparing Governments sector classifications Sam Moon ODI. 3 Strategic priorities are usually organised by sector, comprised of the membership of a number of institutions. 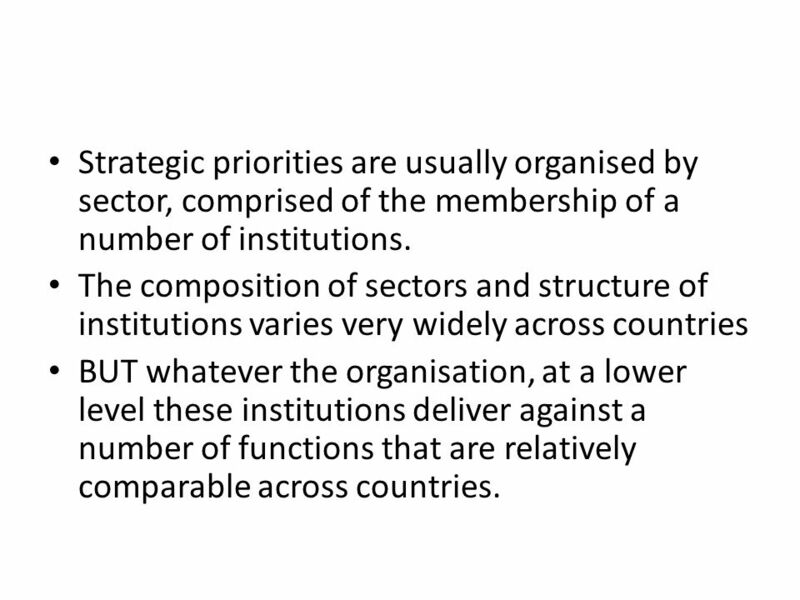 The composition of sectors and structure of institutions varies very widely across countries BUT whatever the organisation, at a lower level these institutions deliver against a number of functions that are relatively comparable across countries. 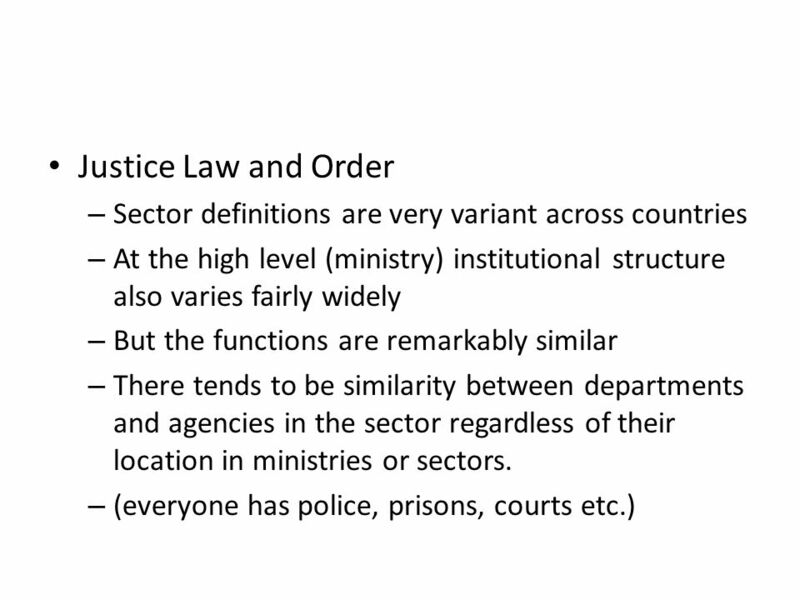 5 So we looked at the institutional and sectoral structures of the domains of education, health and justice law and order in 14 countries. 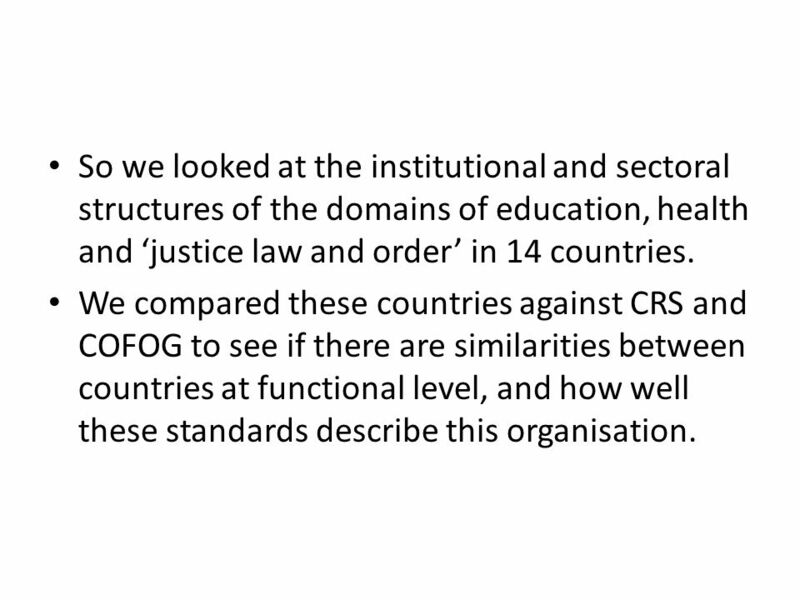 We compared these countries against CRS and COFOG to see if there are similarities between countries at functional level, and how well these standards describe this organisation. 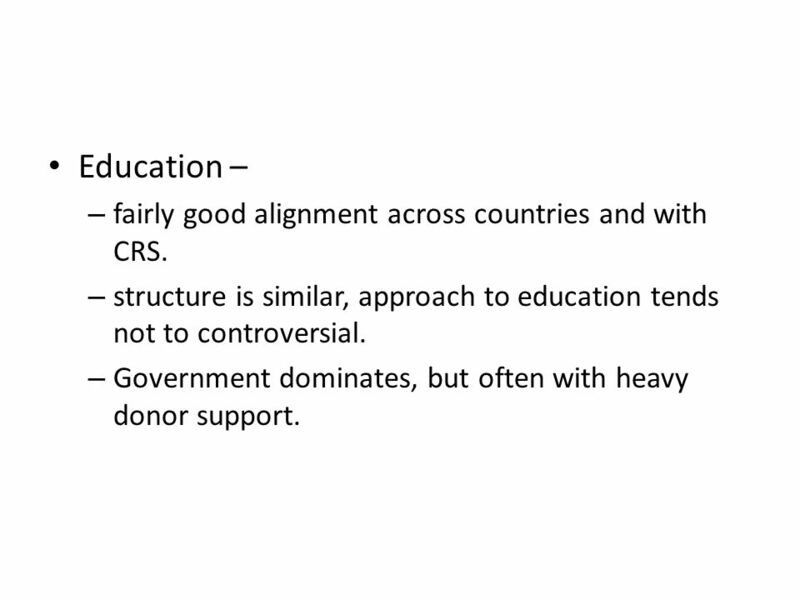 6 Education – – fairly good alignment across countries and with CRS. – structure is similar, approach to education tends not to controversial. 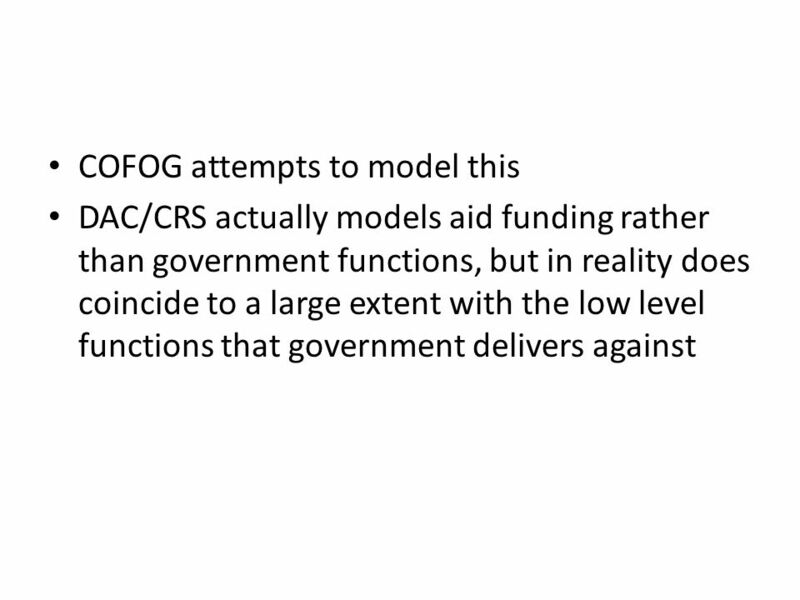 – Government dominates, but often with heavy donor support. 7 Health – Turned out as extremely difficult to model. 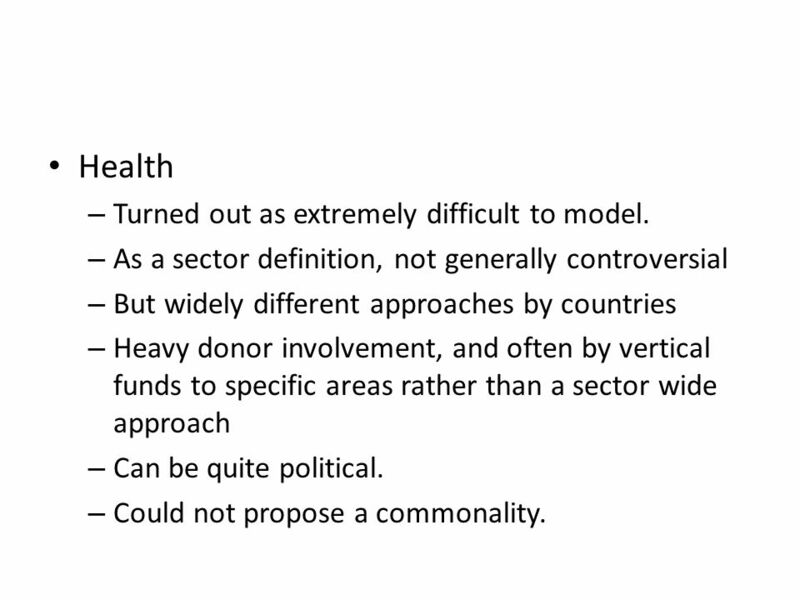 – As a sector definition, not generally controversial – But widely different approaches by countries – Heavy donor involvement, and often by vertical funds to specific areas rather than a sector wide approach – Can be quite political. – Could not propose a commonality. 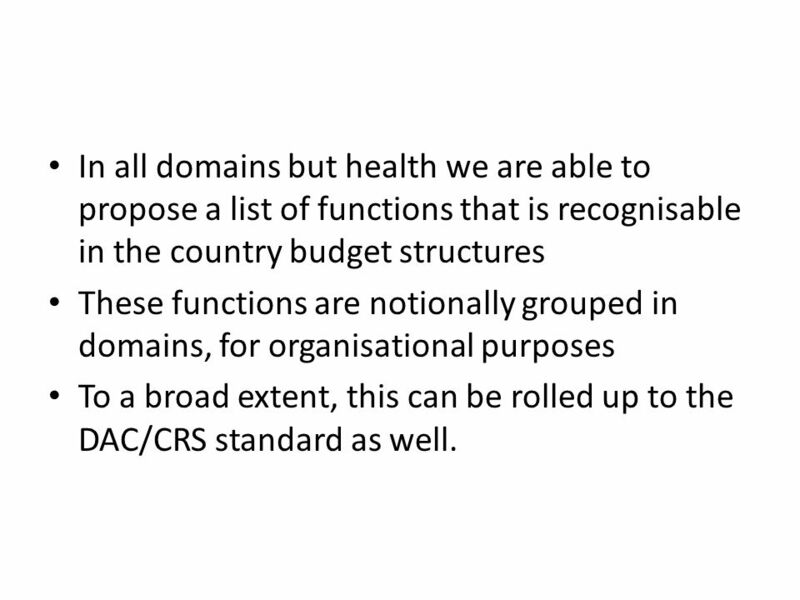 10 In all domains but health we are able to propose a list of functions that is recognisable in the country budget structures These functions are notionally grouped in domains, for organisational purposes To a broad extent, this can be rolled up to the DAC/CRS standard as well. 11 Further Issues and next steps. 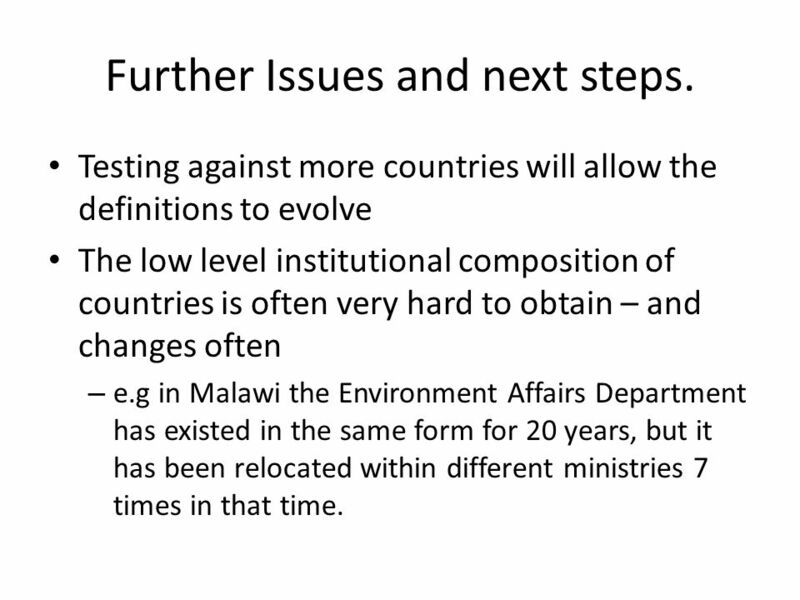 Testing against more countries will allow the definitions to evolve The low level institutional composition of countries is often very hard to obtain – and changes often – e.g in Malawi the Environment Affairs Department has existed in the same form for 20 years, but it has been relocated within different ministries 7 times in that time. 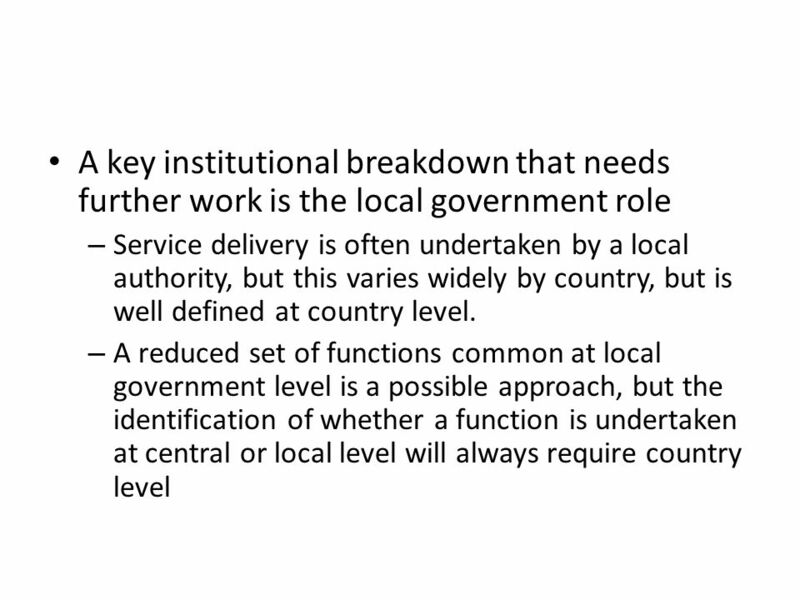 Download ppt "Comparing Governments sector classifications Sam Moon ODI." Experiences in sharing information What can be done? 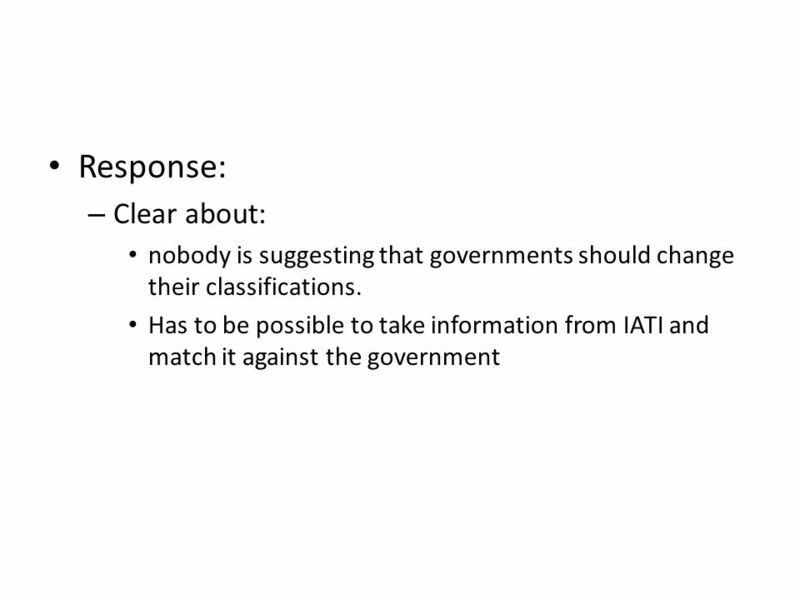 Key findings from the IATI pilots. MECHANISM OF PUTTING AID ON BUDGET MADAGASCAR I SAORA Z EFANIA ROMALAHY P ERMANENT S ECRETARY IN CHARGE OF A ID C OORDINATION O FFICE OF THE P RIME M INISTER. Mutual Accountability and Aid Transparency - Rwanda – IATI Partner Country Meeting, 4th July 2011 Paris, France Ronald NKUSI Director, External Finance. 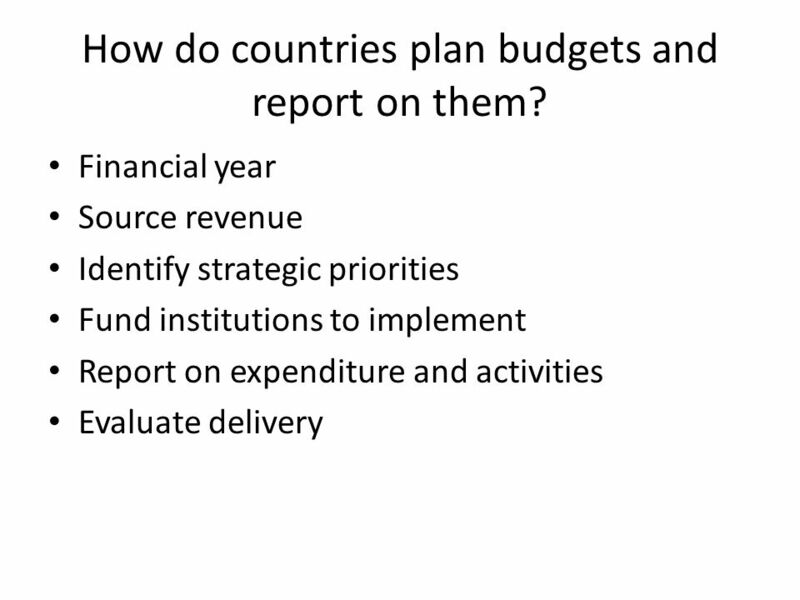 Linking IATI information to recipient budgets. Why? 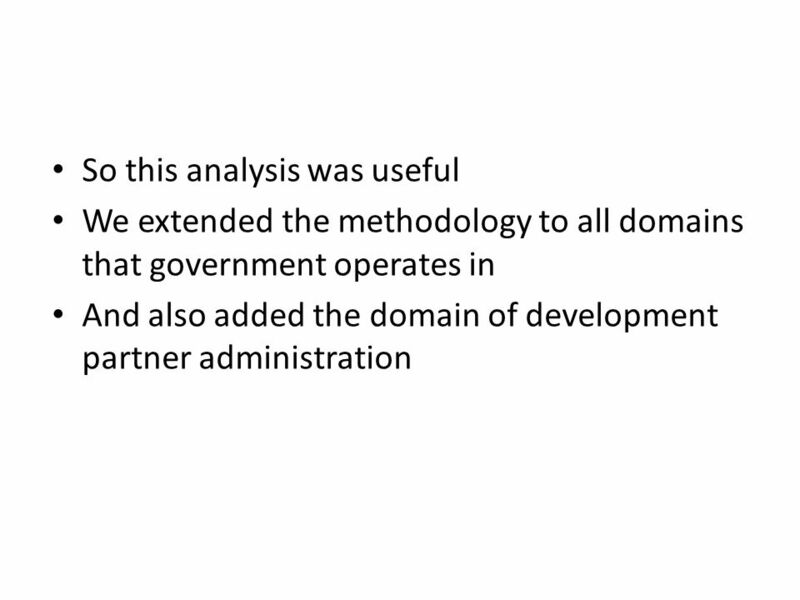 Alignment of donors with government activities Division of labour between all actors Evaluation and. Human Resource Management Modernisation in OECD Countries: Achievements and Challenges Oscar Huerta Melchor OECD, Administrator Public Governance and Territorial. UNESCO INSTITUTE for STATISTICS UIS Education Survey: Questionnaire on Statistics of Educational Finance and Expenditure – B Juan Cruz Perusia February. Budget Alignment IATI Tag Meeting Session 4 4 October 2010. Aligning aid with partner country budgets Aligning aid with partner country budgets Progress update, January 2014. THE PERSPECTIVE FROM THE SECTORS What would Sectors/Line Ministries (LMs) want from an MTEF? What would Sectors/Line Ministries (LMs) want from an MTEF? Aligning aid with partner country budgets Aligning aid with partner country budgets Progress update, March 2014. Mr David Nicol Under Treasurer Chief Minister, Treasury and Economic Development Directorate ACT Government 20 November 2014 Presentation to 2014 CPA Congress. 1 Joint Donor Staff Training Activity Tanzania, 17 - 19 June 2002 Partnership for Poverty Reduction Module 4 - Links between PRSP, Sector Programmes and.